I’ve told you this before, but I thought maybe you needed some pictures to back up my claim. I can multitask till the cows come home, but when I try to have a conversation with someone while multitasking in my kitchen, this is when I know that the cows have indeed come home. So there I was, making cheese. And lunch. While talking to our college-age friend Brittany who was over doing laundry and chatting with me while I did too many things at once. This led to a ranch dressing disaster. I should never talk and cook at the same time. 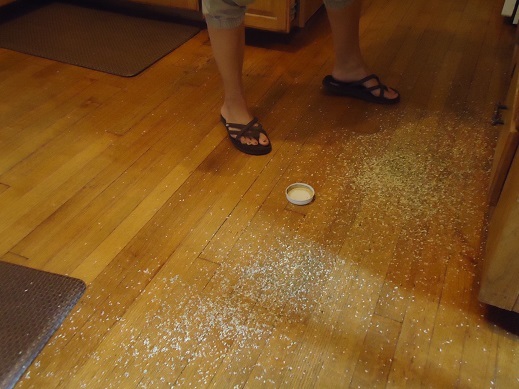 I loosened my dressing mix jar lid, but somehow – and I can’t imagine what it could have been in my relaxed, stress free kitchen – I got distracted and walked away. Coming back to the jar of dressing mix, I gave it a good shake – which is always a good idea so that the ingredients are mixed well before you put them into the buttermilk/mayo. Except that this is not at all a good idea when the lid is not securely on your jar. But I had loosened the lid, so off it flew, as did thousands and trillions of tiny ranch dressing mix ingredients. But trust me. It was much. All over me. In between my toes. Under my feet. Everywhere. That there is a lid that can’t be trusted. No use crying over spilt ranch, but we all declared that very soon, I would smell ranchy (or would that be…raunchy?). 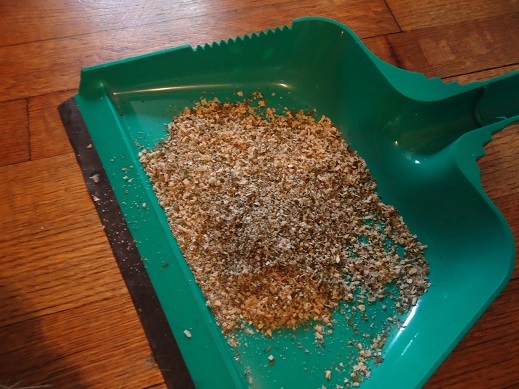 I swept my precious dressing mix into my dustpan and dumped it into the trash. Sad day. Somehow I got lunch on the table, even the Spicy Ranch Dressing. Too bad this story isn’t over yet. Oh no. That was just the beginning. 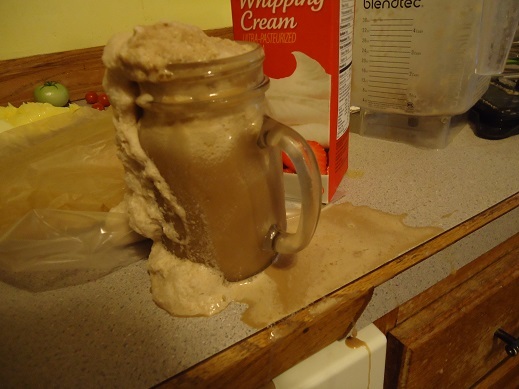 All was well until I tried to talk while pouring the last bit of foamy frappe goodness out of the blender. Blop. It all came out at once. All over the counter, down the front of the dishwasher, and yep – all over my foot and in between my toes. I now had Ranchy Frappe toe jam. I should stop talking and cooking at the same time. You would think I’d know better by now. Always be sure the lid is securely on your jar of dressing mix before you shake it. This is obvious. Frappe foam blops. It just does. Stop being surprised by this, or maybe you can just get out a spoon to help it to ease out nicely. I’d love to hear what you can do until the cows come home, and maybe the point at which you have crossed the line and realized that the cows have arrived. I have a long-running joke with my husband, as I am the primary driver in our carpool: I can talk, I can drive safely, or I can remember where I’m going – choose only 2. I thought I was the only one who can’t do all three. Thank you! Love seeing a picture of you in the blog posts (even if you are covered in ranch dressing)! I find the solution is to talk to myself about each task I’m doing. “SO, HONEY, HOW WAS SCHOOL TODAY? Okay, first I need the tea pan… water… heat on high. Now we’ll preheat the oven… 400… REALLY, THE BEST PLANNER IN THE WHOLE SCHOOL, WOW!! Now we put in the tea bags, don’t forget to reduce the heat!, and then we’ll cut the chicken…” My teenager thinks I am Super Cool when I do this, obviously, but hey, whatever gets dinner on the table before the baby wakes up! THANK YOU! THANK YOU! You’ve made my day!!! I love the ” Ranchy Frappe toe jam”! I’m sorry for all your maladies but it’s nice to know ones not alone. As my dear hubby calmly says, “. . . . . just another day of life with Linda! ” Thanks for sharing, Laura – especially the pics. ? Wait until you hit your late 40s. There are so many hormonal changes going on that my brain is in a permanent fog. I not only shouldn’t talk while doing something, sometimes I shouldn’t even think! This morning while making breakfast I thought about needing to call the eye doctor to get my vision checked. Sat down an hour later to work and couldn’t find my glasses. I searched ALL over the house looking for them, then decided I must have left them somewhere yesterday. I didn’t find them until I went to get milk to add to my tea. Apparently, I’d put them in the fridge along with the other breakfast ingredients. Doh! I just LOVE all this transparency going on here……I’m right with most of you! I, too, cannot do two things (successfully) at once. I especially cannot cook and talk at once, either. One time (long ago, of course; these things never happen to me now that I’m almost 50…), when I was attempting to converse and serve my guests a nice drink of soda (pop), I actually gave the bottle a good shake before I opened it……. 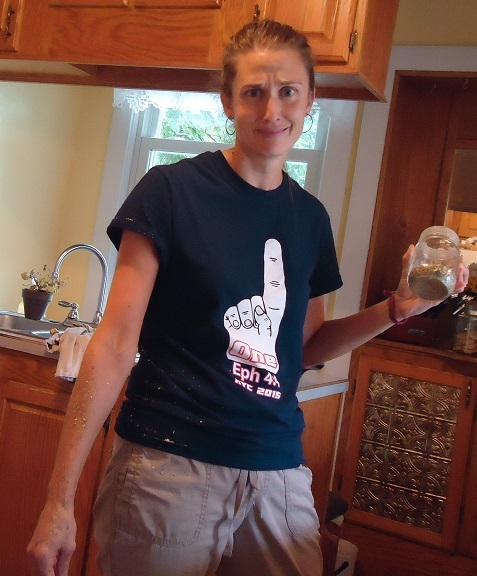 I wish I could say I’d only shaken a container with a loose lid and had it fly up all over me once. Ironically, on the same day I was telling my children a story about when I had done that with a ketchup bottle many years ago (while sitting next to an employer, no less), I did it again with a bottle of kefir. I had kefir ear wax for quite a while! Bleck.